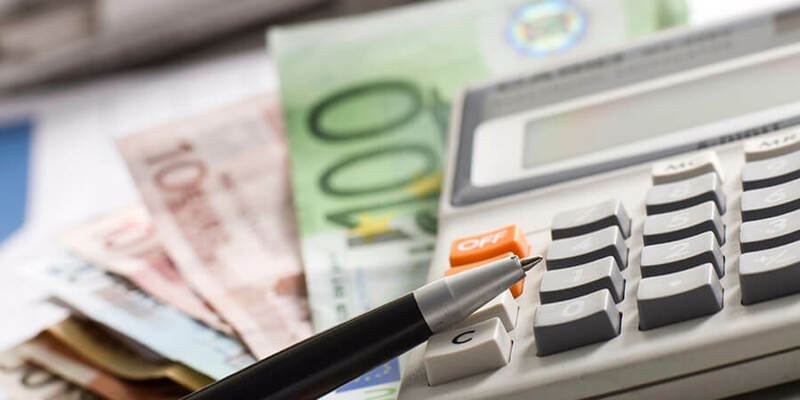 Are You Maximizing Your Profits? - The AIM Institute Are You Maximizing Your Profits? 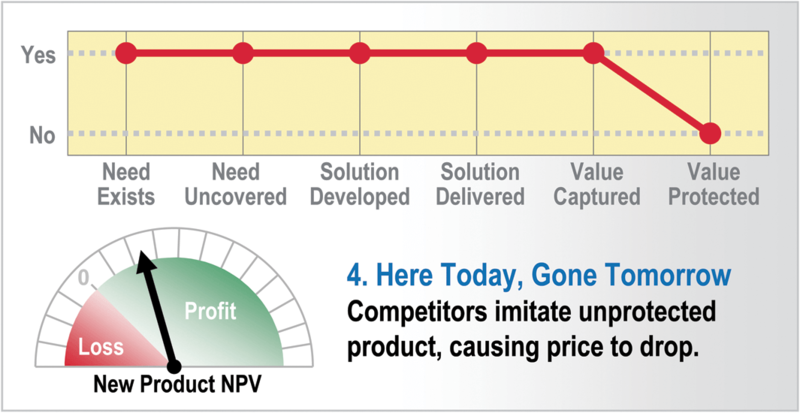 The AIM Institute > Insights > Blog > Product Development > Are You Maximizing Your Profits? Are You Maximizing Your Profits? Have you noticed that all new products are not created equal? Some products deliver enormous profits for years or even decades, carrying whole businesses and careers on their sturdy shoulders. And then there are the tired, the poor, the huddled masses of wretched new products you wish were on your competitors’ teeming shores. What separates them? 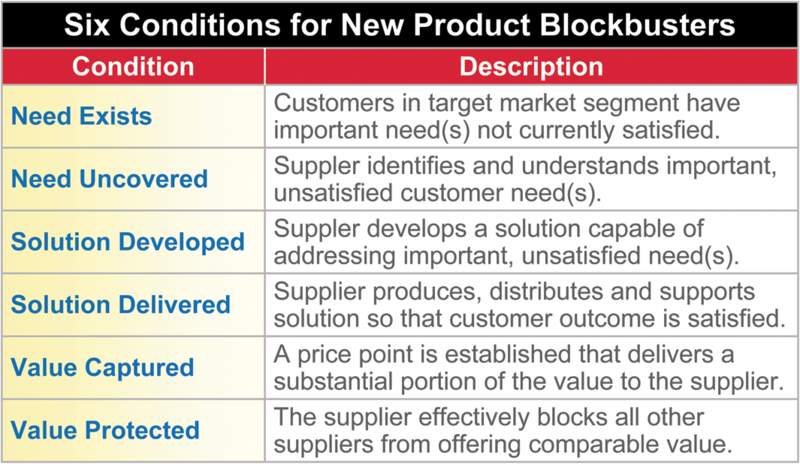 Our work at AIM indicates blockbuster products must meet six conditions, not just four or five. That would be like getting four or five digits right in a six-digit lottery… after you paid a lot to play. It’s rare for a product to nail all six conditions. Let’s consider four of the most common and damaging failure modes so we can be intentional about avoiding them. Failure #1: Don’t Bother… Please No significant need exists: Customers in the target market segment are content with what they have today. (Sure, they’d like lower prices… that never goes away.) As illustrated, the out-of-touch supplier develops a solution for an imaginary need. The spending to develop this product creates negative net present value (NPV) for the supplier. Failure #2: Nice Shot, Wrong Target In this case, the customers have very real unmet needs. Our supplier misses these, instead developing a product based on internal, preconceived notions and a desire to push his really cool technology. If the repairman fixed your washing machine when your dryer was broken, would you pay him? Neither will these customers. 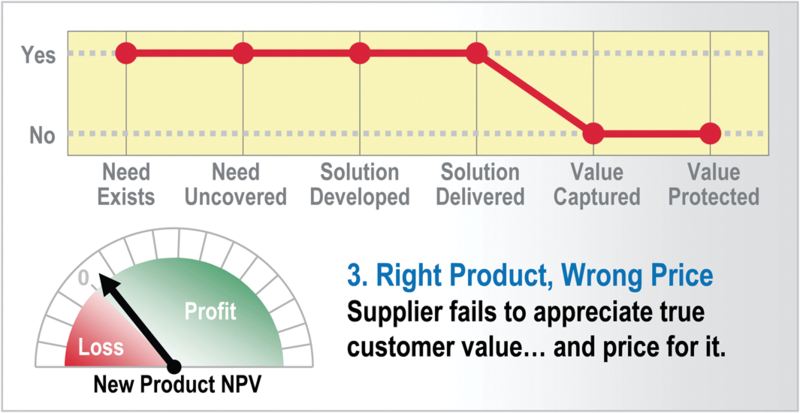 Failure #3: Right Product, Wrong Price Now our supplier is doing better: Customers are happy because he uncovered and met their important needs. Maybe too happy. He identified their needs, but didn’t understand how much value customers would reap using his product. As a result he left a lot of money on the table when he set his product pricing. 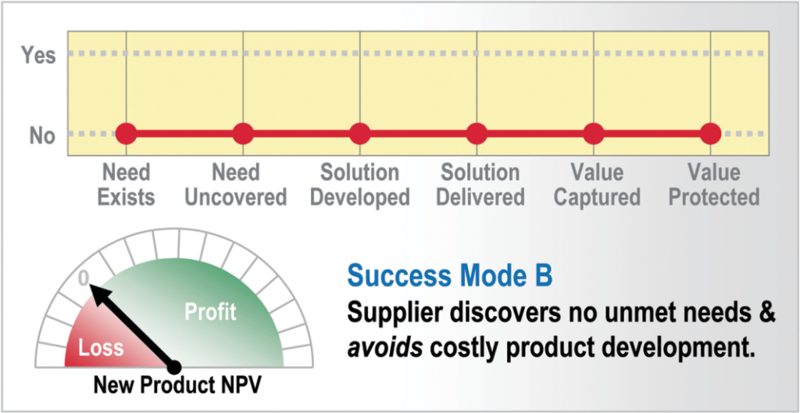 Failure #4: Here Today, Gone Tomorrow Solid NPV is delivered due to good market homework, good problem solving and good pricing. This has not gone unobserved by competitors. Unfortunately, our supplier has not blocked them using patents or other means… preventing a good financial story from becoming a great one. Don’t Bother… Please You should quantitatively test to see if a market segment is already content before spending a dime in product development. No excuses now: This can easily be done with a few B2B customer interviews. Nice Shot, Wrong Target Use these same interviews to probe for unspoken needs… and quantitatively measure how much customers want each need. 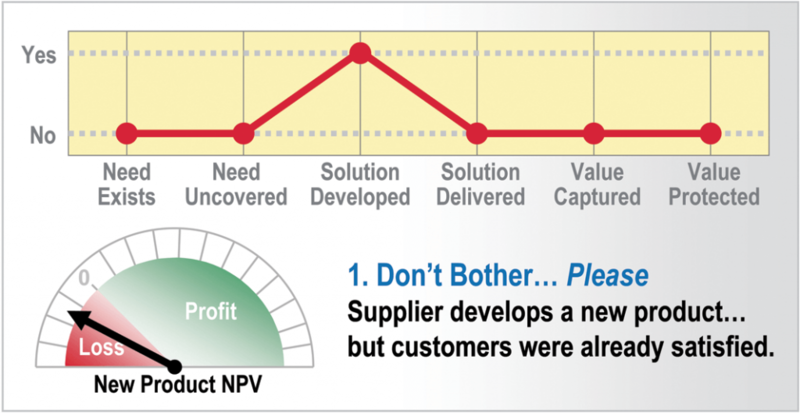 Don’t even think about solving a need unless you know customers truly care about it. Right Product, Wrong Price Some companies fixate on squeezing higher prices from tired old products. Fine, but there’s more juice in understanding customers’ needs early. This lets you price new products to fully capture that value. Here Today, Gone Tomorrow When you carefully explore customers’ worlds, you’re more likely to find non-obvious needs. Since competitors haven’t worked on these, this often leads to patentable solutions and protected pricing for you. There are actually two success modes, not one. 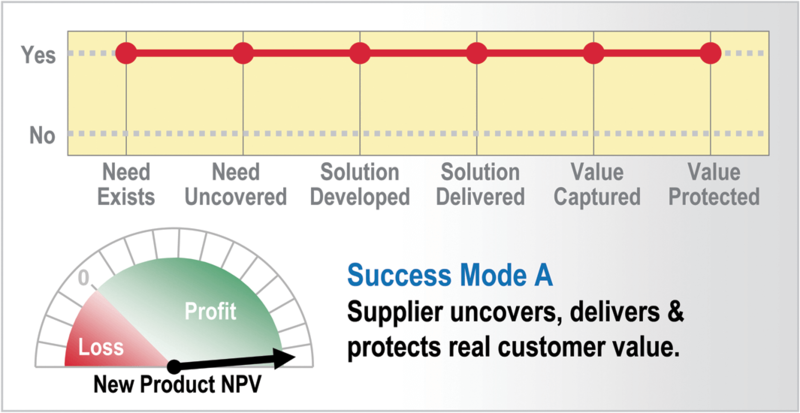 The obvious one is Success Mode A, in which the supplier “rings the bell” on all six conditions. Deliver just a few more of these and you’ll be wildly successful. But don’t ignore Success Mode B: You thoroughly search the market segment, but find no unmet needs. So you walk. May not sound heroic, but it’s the only way to ensure enough resources for Success Mode A. Remember: Your unwillingness to walk degrades your ability to win. So encourage teams to drop projects customers don’t care about. Celebrate these decisions and step briskly on to the next opportunity. 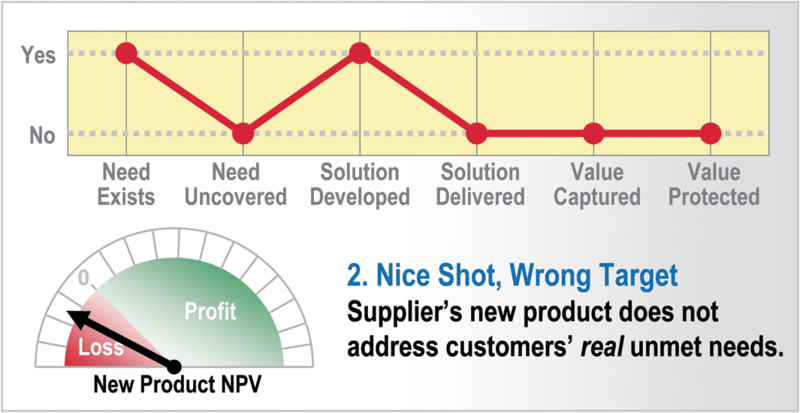 Today, the story of new product development is a story of wasted resources & opportunities. As with quality and productivity improvements in recent decades, that story will certainly change in the future. But for now you can easily waste fewer resources & opportunities than your competitors. While that may not sound inspirational, it is a powerful competitive edge. Just tip the scale from failure modes to success modes with solid up-front work. The AIM Institute offers a complete system for winning at this up-front work called New Product Blueprinting. It’s finely-tuned just for B2B producers and is all about implementation: combining a skills-intensive workshop with follow-up coaching and tracking. Learn more about Blueprinting here or contact us and we’d be happy to discuss it further with you.